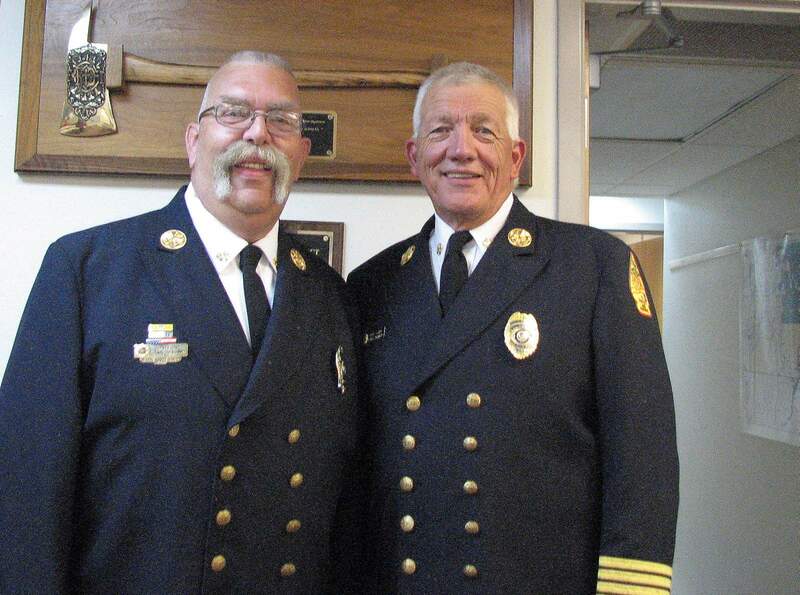 Former Los Pinos Fire District Tom Aurnhammer, left, retired in December, while interim Fire Chief Larry Behrens is back at the district after retiring. A petition to recall the five members of the Los Pinos Fire Protection District board was not turned in to the La Plata County Clerk and Recorder’s Office by its 4 p.m. deadline on Monday. “I don’t know if this is a blessing or a curse, but you’re all still board members,” said interim Fire Chief Larry Behrens at the board meeting last night at Station No. 1. Former deputy chief Kevin Ratzmann and community members started the recall petition after Ratzmann was fired in December. The recall was supported by some of his colleauges. Ratzmann said his firing was in retaliation to bringing up ethical concerns surrounding former Fire Chief Tom Aurnhammer, who retired in December. The current chief, Behrens, came out of retirement to fill the void. Ratzmann said the board is a “good ol’ boys club” that was protecting Aurnhammer. He said the petition didn’t happen because in early January, the board directed Behrens to tell the crew if they got involved in the recall, they would be terminated. Behrens said he recorded the meeting in case something came up and that he warned the crew they should be cautious because their rights as private citizens are not the same as employees. Ratzmann is now the fire chief of the Grand Lake Fire Protection District. A draft on the new fire chief job description was approved Monday at the meeting. Behrens made a note to bring back employee evaluations, including a chief evaluation. There have not been any evaluations since Behrens retired. “That’s one thing I hope we take from this whole journey, is accountability at every level,” Behrens said. The board is now focused on drafting an advertisement for the chief position, which they postponed because of the recall petition. A draft will be presented at the next board meeting on March 11. The board is also drafting a letter to the community as they make an effort to rebuild trust. But budgeting for the future is now the fire board’s main concern. President of the board James Brown said he is thankful for the community’s silent support.